The home improvements stores have started stocking seeds and spring bulbs. Raspberry canes tempt me, but the weather lets me know it's still too early for planting. After an amazingly dry November, December, and January, February has decided that Utah winter has begun. 1. I'm thankful for the peaceful falling of the snow. 2. I'm thankful for indoor plumbing. Unlike Drexel, I don't have to venture out when nature calls. 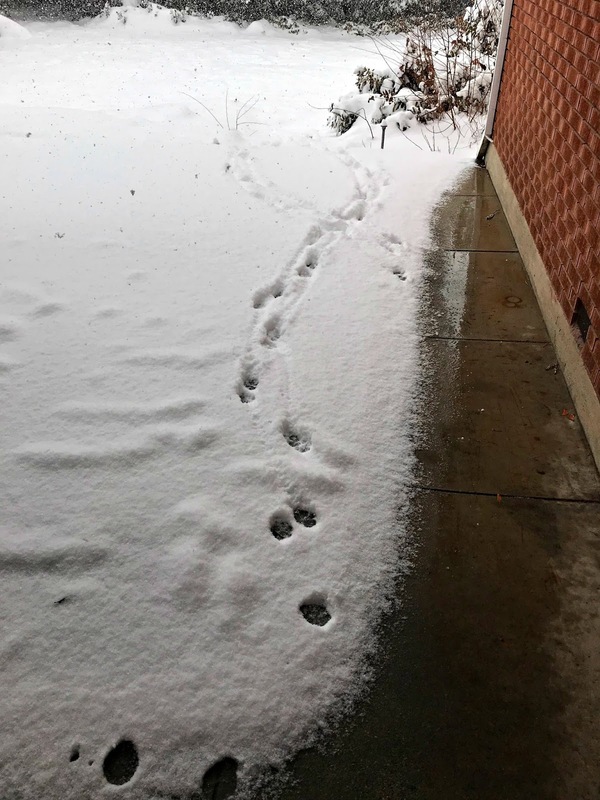 Photo: A figure-eight shaped set of paw-prints in the snow. Drexel walked under the eaves of the house, then ventured out in the snow only far enough to find the nearest bush, then turned around and walked back to the safety of the bare patio again. 3. I'm thankful that, also unlike Drexel, I tend to enjoy playing in the snow. 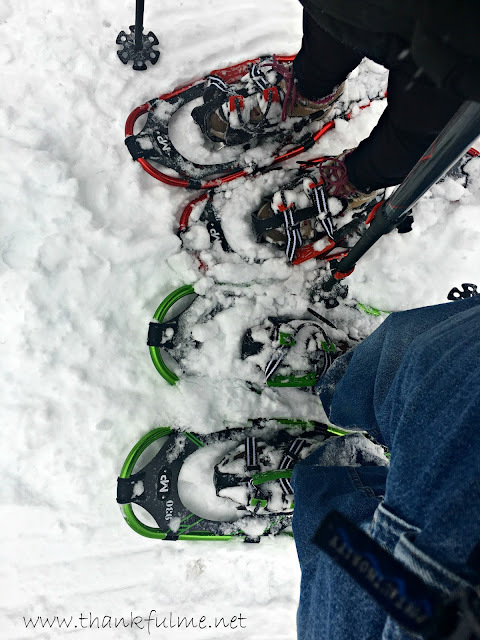 Photo: John's green snowshoes, and my red snowshoes are visible as we hike in the snow. 4. I'm thankful for a warm dry house to come home to when I'm cold and wet. 5. I'm thankful that by next winter, we won't even have to drive to reach a trail, but can simply walk out our back door and up the mountain. Photo: My wild, snow-covered back yard blends into the mountain. 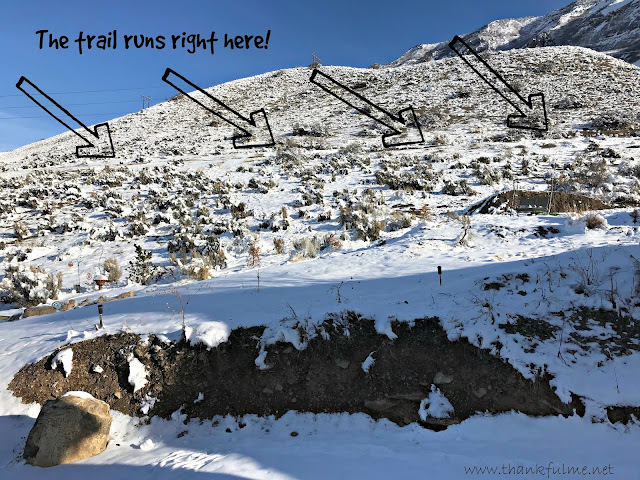 Arrows on the photo indicate where the trail runs. 6. Although changes weren't as dramatic as last week, I'm thankful that progress continues on the house. This past week, new baseboards were installed on the main level. They are plain, and still need to be painted (white), but I like them. 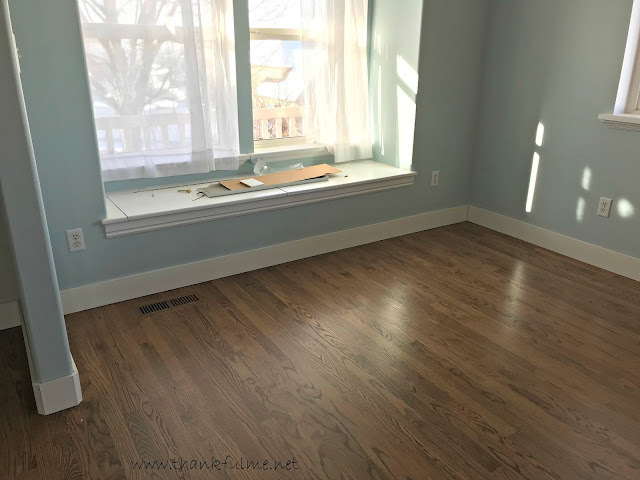 Photo: Tall plain baseboards define the bottom of the light blue living room walls. The old air intake register, and packaging for the new one, sits on the window seat. 7. I'm thankful to be able to rent a house to stay in during this year. I love this 1950's rambler, and I love the artistic details--even in the pattern the snow makes on the roof of the patio. Photo: A snow-covered table and chairs sit on the patio overlooking the back yard. The patio roof is made of slats of wood. The snow, as it partially melts and then freezes again, makes a pattern of rounded waves that hangs from the wooden slats. 8. 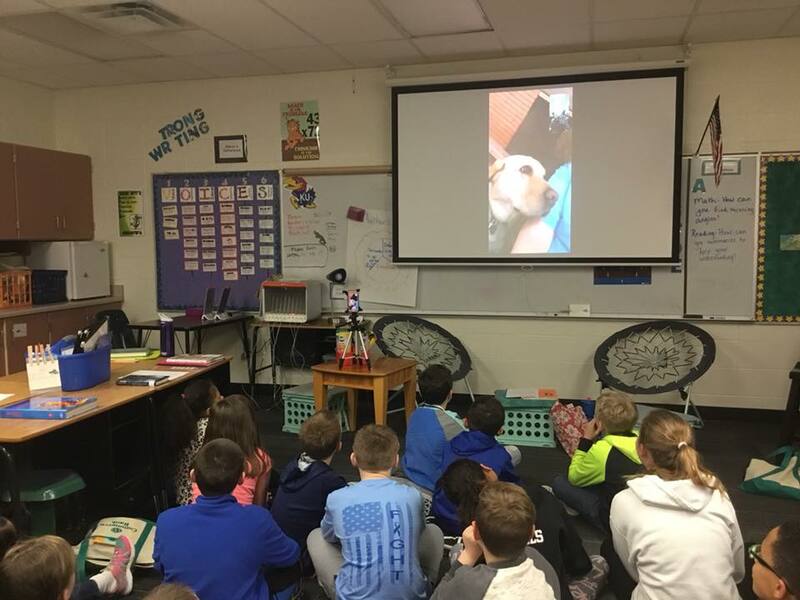 I'm thankful for the chance to talk (via FaceTime) with a class of elementary-school students in Kansas about what it is like to be a puppy raiser for Guide Dogs for the Blind. Even though I'm not currently raising a puppy, I enjoyed the years I did, and love to talk about my experiences with that great organization. Of course, I'm pretty sure that the kids were most interested in seeing Drexel, and who can blame them? 9. I'm thankful for retrospect, technology, and connections. After I communicated with students in a state I've never visited, I thought about how in the world (purposely chosen wording) I was even asked to speak with children in Kansas. If my beloved basset hound Lucy hadn't passed away, I wouldn't have started puppy-raising in California. If I hadn't started a blog, I probably wouldn't have found Lizzi's Ten Things of Thankful blog hop (started in England), and I wouldn't have met (online--we have yet to meet in person) Dyanne (in Missouri), who happens to be good friends with Teresa, the teacher of the class (in Kansas). Everything worked together to allow me (and Drexel) to visit from Utah with 4th-graders in Kansas. Amazing! 10. As always, I'm thankful for John. With apologies to Dr. Suess: He hikes with me on a snowy day. He shovels out the driveway. He drives the car on the icy street; his winter-driving can't be beat! I might not like green eggs and ham, but I'm glad John is part of my fam! Photo: John and I pose for a selfie while snowshoeing. Snow-covered trees are behind us. Kudos to Josie Two Shoes for hosting the Ten Things of Thankful blog hop. Feel free to join in! A lovely list, and i am thankful for the technology that allows us to get to know so many people in so many places. Doing the Face Time chat with the school is so cool.Thinking back to discover all the ways our lives lead us to the next step, and the next, and the next is so awesome. I love your Dr. Seuss rendition! Drexel prefers a dry climate; he's not too keen on precipitation in any form. I've never tried snow shoeing, but I think I would like it. You windowseat will be a great place to sit next winter to watch the snow falling. Snow shoeing is amazingly easy--it's better than trying to hike in snow in regular shoes. I want to put some sort of cushion in the window seat, but I haven't figured out exactly what I want yet. Nice list of thankfuls. We love to snowshoe, but never got enough snow that stuck around to go this year.Have a great week! 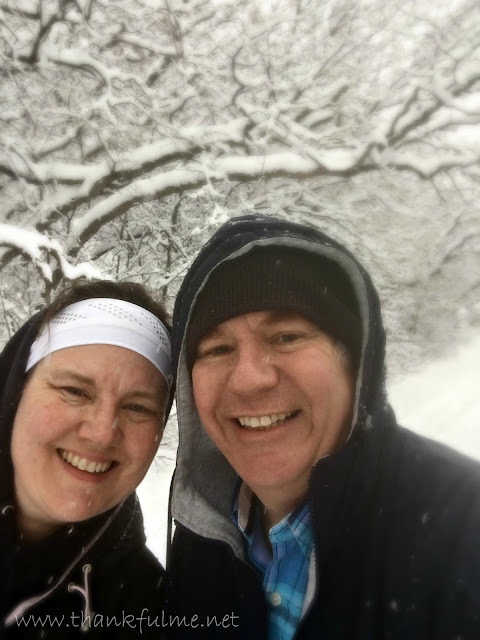 This week was my first attempt at snowshoeing, and I really like it, too! Great post! You must have some amazing views. We got a little snow this year in N. Louisiana, but nothing to brag about. I love the way you describe the because of this/this sequence in #9. I'm sure glad you like snow, because it looks like it is going to be a big part of your Utah life. I do so like your poem of John, yes I like it Kristi I am. It was wonderful that you got to share your story about raising Guide Dog puppies with the students in Kansas. Like you, I am ever amazed at how one connection on the Internet leads to another and another and you end up knowing all these wonderful people you never would have met otherwise! I can guess how much fun the students had seeing Drexel and getting to hear about something so interesting! They will remember so much better than if just reading about it from a lesson! Your new home grows more beautiful with each passing week. I love your choice in trim and the peaceful paint colors! That window seat is wonderful, so is the perfect location for your lifestyle. It must be exciting to see it getting closer to move-in ready! 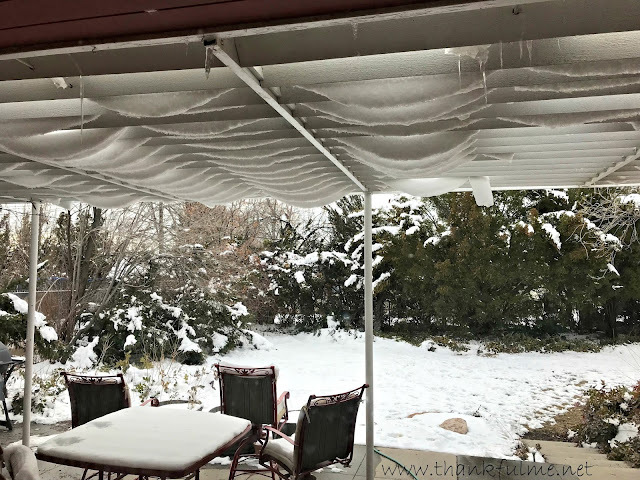 The photo of your present patio was wonderful, the beauty of the snow "swags" hanging from the slats is a bonus winter gift! I'm beyond thrilled that you and Teresa were able to connect! The internet has made our world larger and yet smaller at the same time.